Mark your calendar for DankBoy’z DanksGiving! 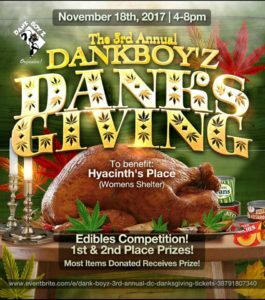 Dank Boy’z is hosting the 3rd Annual Washington DC Danksgiving Item Drive and Edibles Competition Saturday November 18, 2017. Our purpose is to showcase the many talents of DC’s edible makers as well as giving back to the community. We want to show the world that the cannabis community is more than “a bunch of stoners”. The Danksgiving will consist of a cannabis edible competition and wish list drive for Hyacinth’s Place. Those who enter into the event will have their treats judged for a chance to earn the title of DC’s Dankest Treats and win a prize! The Danksgiving Committee’s goal is to provide as many of the wish list items that Hyacinth’s Place is in need of see wishlist below. In order to achieve this goal we are asking all attendees to donate at least three non-perishable food OR two non-food items. The larger non-food items on the list such as twin sheets and mattress cover will count as two items. The person who brings the most items will win a great prize. To attend the eventyou must register in advance, be at least 21 years of age and bring items to be donated to the shelter. This year we have also added a VIP entry option. We plan to have vendors, music, raffles, free give aways and much more!